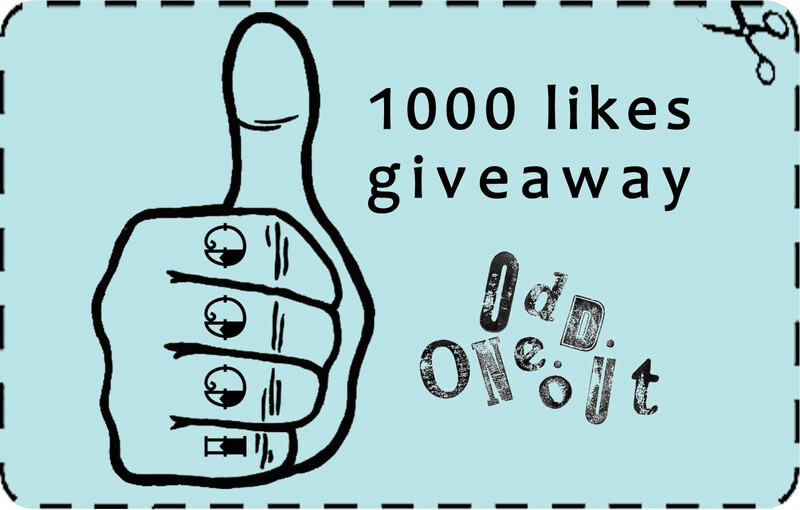 Odd One Out: Finally another giveaway! 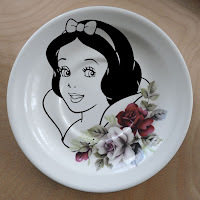 So as requested I am going to be giving away a custom designed, hand-painted vintage plate! Wahoo! Now this can be anything from adding your name to one of my existing designs like the "love birds banner", a favorite image or character or even something out of your wildest dreams like this fab Bacteria plate below. For more ideas check out my custom album on Facebook and get thinking! I would love to know what you would all like your very own custom plate to look like............. so to go into the draw just email me at oddoneout@xtra.co.nz or leave a comment below letting me know your idea. Be as detailed as you would like, you can even specify a style or colour of plate and I will see what I can do! I will draw a winner randomly on Wednesday 20th June at 7pm-ish and let them - and then you all know! So get those thinking caps on - I cant wait to see what you all come up with! I have two fascinator plates and would love something to go in the middle. I spent two years chasing the love of my life, we have been official for almost a year and every day makes the chase worth more and more. I would love to work together on something to symbolize this moment. Hi Niki, you already made the beautiful “Home Tweet Home” nest for my sister and her family. I'm thinking about another one for my friend, their familiy name translates to “Crow's Nest” so a crow mum, dad, girl and boy sitting on or flying around their nest would be awesome! I adore your designs.. the first I ever seen was the fist with knuckled tattoo saying "cake" and I was in love.. so maybe that one? Or the hand making a love heart. OR the super fly paper plane. :) LOVE them. I love your work! Have brought the Tu Meke plate for a friend and have my heart set on a 'super fly' some day soon. I would LOVE a plate in any colour circa 1970's preferably with a design of a old atomic bomb painted on it. With the caption "My heart goes boom". Oh! How about a cute little plate ( A little saucer or such)with a little salt shaker and a little pepper shaker holding hands with the saying " We go together like salt & pepper "
I would love one that had all my kids names on it. Not sure how to go about it yet. Maybe three little owl's sitting on a tree branch. Oooo - I would LOVE to have one with a 1950s pin-up girl that said "Mistress Vixen"! I really love the idea that others have mentioned using a family tree. Perhaps a beautiful tree with leaves somehow with the names and birth dates also include our marriage date. 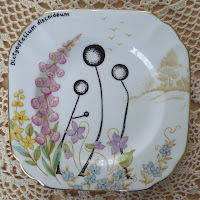 I also would love a plate with a butterfly design with one of my favourite quotes "Just when the caterpillar thought the world was over - it became a butterfly." My favourite quote... "Behing the clouds the sun still shines". I kinda imagine a little peaking sun behind some blue or grey pattern. 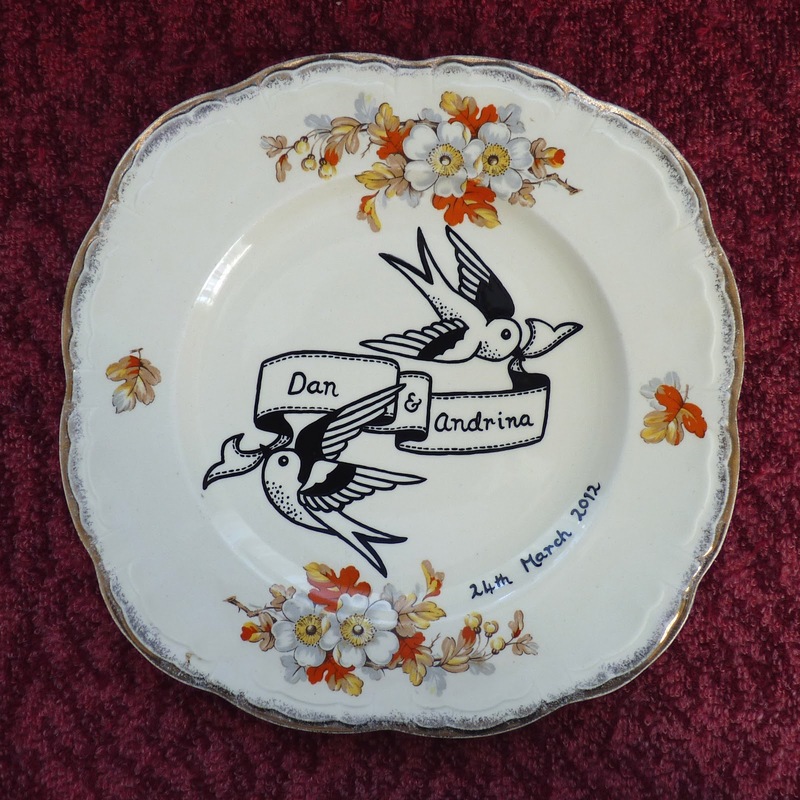 I'd love a custom plate with your 'love birds' drawing on it with my fiance's name and mine on the banner and our wedding date along the side of the plate. 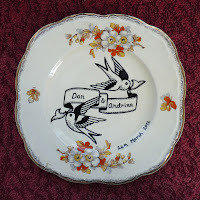 Swallow birds are a running motif in our wedding stationary so this would be perfect!